Laparoscopic gallbladder surgery (cholecystectomy) is done to get rid of gallbladder and gallstones through a lot of little incisions in the abdomen. The surgeon in charge of this operation enlarges your abdomen with carbon dioxide or air to view the operation area properly. The surgeon fixes a scope that is lighted on a video camera (laparoscope) which is inserted into one incision close to the belly button. 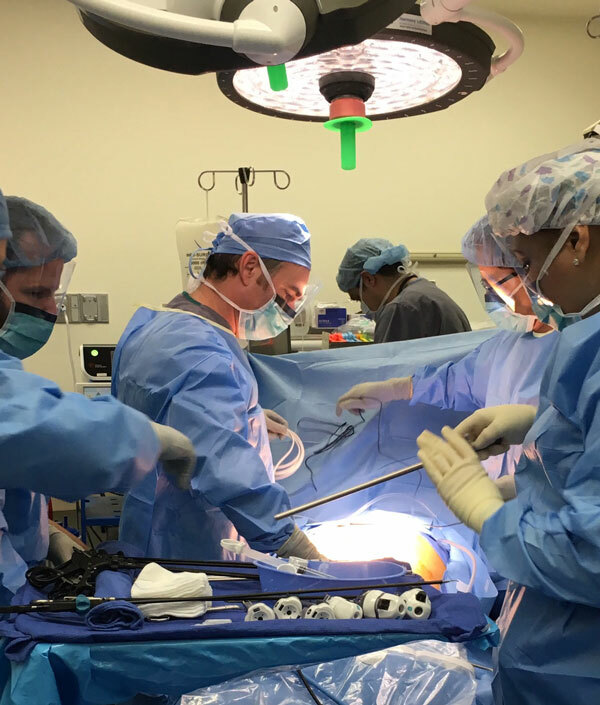 The surgeon then uses a video monitor as a guide while inserting surgical instruments into the other incisions in order to be able to remove your gallbladder. Before the removal of the gallbladder, you might need to have a special X-ray procedure done. This procedure is called intraoperative cholangiography and it shows the inside of the bile ducts. A minimum of 2 hours’ general anesthesia is needed to carry out this surgery. After the surgery, bile flows from the liver from the main bile duct and takes into the small intestine. Because the gallbladder has been taken out, the body will not be able be to store bile after meals. In most cases, this doesn’t affect digestion. About 5 to 10 out of 100 laparoscopic gallbladder surgeries carried out in the United States, the surgeon has to opt for an open surgical method a requires huge incision. Medical issues that need an open rather than laparoscopic surgery is scar tissue, unexpected inflammation, injury, and bleeding. After surgery, you could might be required to stay in hospital for about a day or two. While for some patients it could take up to a week to 10 days before they can get back on their feet as they are likely to be very sore after having a laparoscopic gallbladder surgery. But will be back on their feet faster than people who have open surgery. No special diets are required after surgery. Laparoscopic gallbladder surgery is carried out to treat gallstones which lead symptoms unless a surgery is not necessary. Laparoscopic gallbladder surgery is a very effective and safe method for the removal of gallstones that are found in the gallbladder. It can’t be used in removing stones that are found in the common bile duct. There is the possibility that gallstones can be formed in the common bile duct a couple of years after the gallbladder has been removed, although a case like this is rare. Infection as a result of an incision. Injury to the small intestine with the instruments that are used during surgery. Gallstones could still be stuck in the abdominal cavity. Bile can leak into the abdominal cavity. There could be injury to abdominal blood vessels, like the main blood vessel that carries blood from the heart to the liver (hepatic artery). A gallstone can be pushed into the common bile duct. More surgery might be needed to fix these complications. After undergoing gallbladder surgery, some people might experience abdominal symptoms like bloating, pain, gas, and diarrhea (postcholecystectomy syndrome). Recovery time is way quicker and less painful than open surgery. You won’t have to spend a lot of time away from work and other important activities after having laparoscopic surgery. Is Laparoscopic Gallbladder Surgery in El Paso Right For You? Not everyone is a good candidate for laparoscopic surgery in El Paso. No matter what information you read online, the absolute best way of finding out whether or not laparoscopic surgery is the right choice is to schedule an in person 1-on-1 consultation with our experienced laparoscopic surgeon, Dr. Benjamin Clapp. To schedule an appointment or for cost & pricing information, please call (915) 351-6020 or conveniently request an appointment online.